Carte de visite of the catafalque (raised platform) on which Abraham Lincoln's casket was placed in the rotunda of the Ohio Statehouse in Columbus, Ohio, on April 29, 1865. There is a 2-cent tax stamp on the back of the card. 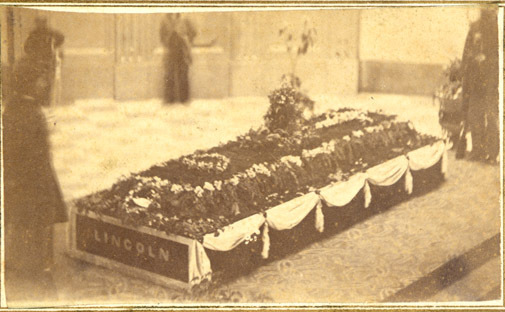 On Saturday, April 29, 1865, Lincoln's funeral train arrived in Columbus at 7:30 A.M. Lincoln's casket was taken to the Ohio Statehouse where he laid in state in the rotunda. The Statehouse was draped in black crepe for the occasion. Thousands of visitors came throughout the day to honor the fallen President.